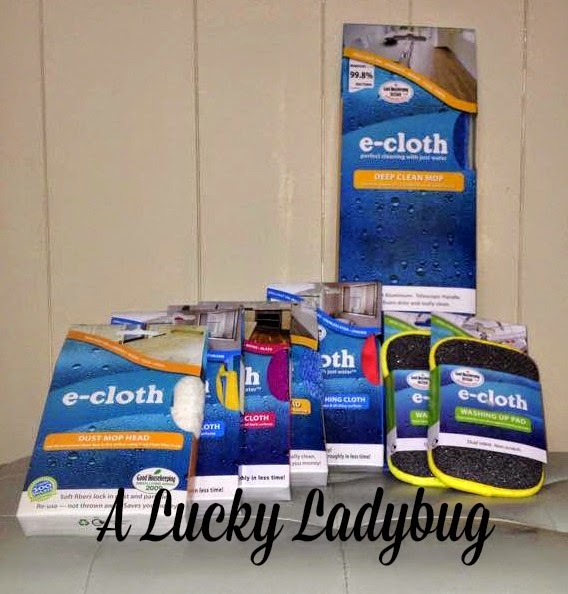 I was recently asked by e-cloth to review a range of their products which couldn't have come at a more perfect time. My family was getting ready to move into a new home and what a perfect opportunity to try something like this out. 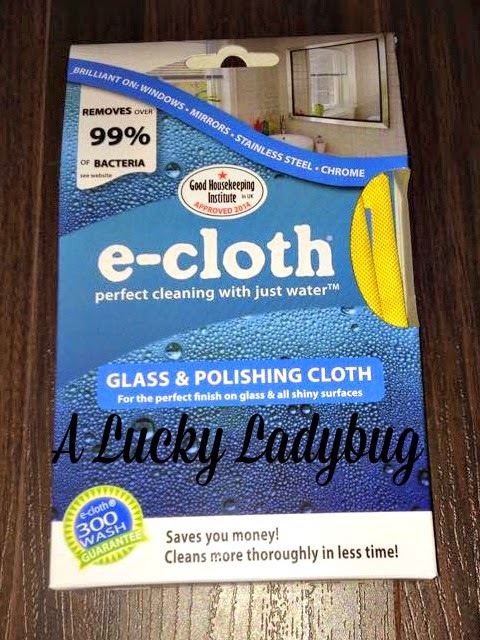 As most of you know, one of my goals is to be an earth friendly and chemical free household which puts e-cloth right up my alley. 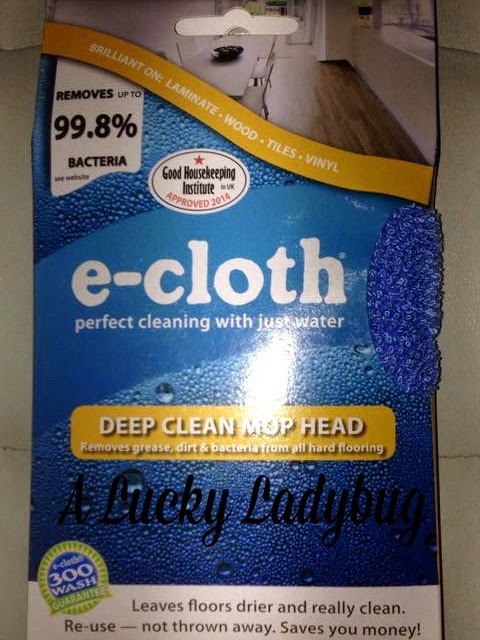 "e-cloth products enable a chemical-free cleaning process that only uses water." In my move I wanted to make sure everything was being cleaned as it was being set up as well as any parts of the home when we moved in. I'm not a fan of chemicals like said previously, so for me to review a cloth that requires no cleaners and only water was exciting! During the move we had some friends that were helping us unload and set up our home. My friend Tiffany asked me to get her a rag so she could start dusting and when I only handed her a wet towel she looked at me like I was crazy asking for a cleaner too! Tiffany knowing how important it is to me to keep my home chemical free was a little hesitant at first as to how well the e-cloth would do. Not even five minutes later she was screaming with excitement (mostly because she knows how cheesy I can be about these things)! She couldn't believe how well the cloth did at dusting without a "dusting spray". She then was telling her husband that they should too invest in purchasing the e-cloths so save themselves money as well. The best part of it all that after dusting book shelves that have been in the garage for months due to moving, they were wiped completely clean with no sign of streaking. All it takes is wetting the cloth and your free to start your cleaning. With a normal towel or even lets say the horrid eco-enthusiasts word paper towel, with just water you would see streaks as well as dust even moments after on the surface. I would also be concerned the surface wasn't truly clean without using something to kill any germs or bacteria. "Scientific research carried out by world renowned Silliker Group, has proven that e-cloths also remove over 99% of bacteria." All around, I've seen nothing to prove this wrong and I honestly think these are the perfect tools to have in any home! Recommendation: To see that my friend was so excited about cleaning in an eco-friendly manner and then wanting to continue to clean is an accomplishment in itself. 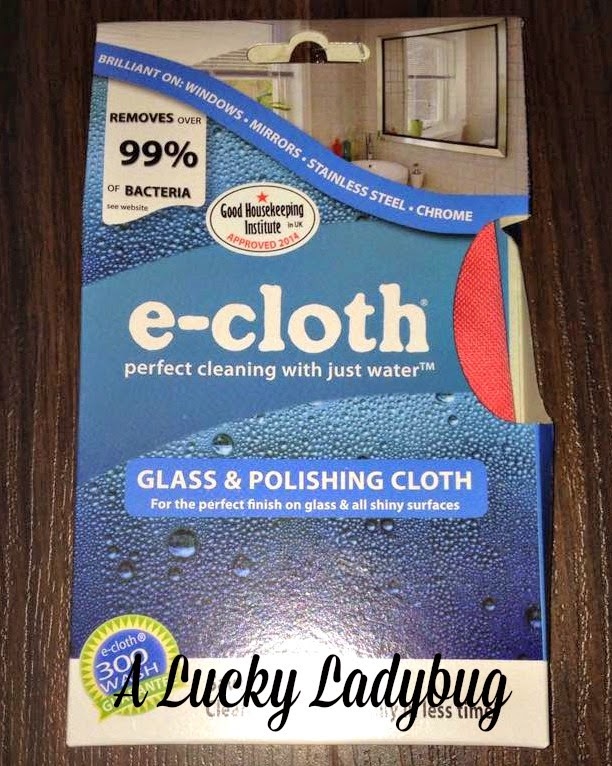 I highly suggest trying e-cloth. If you are worried about having to buy a whole package of cloths, don't you worry they have single packs along with value packs! More bang for your buck with everything being just as affordable as normal sponges and towels! 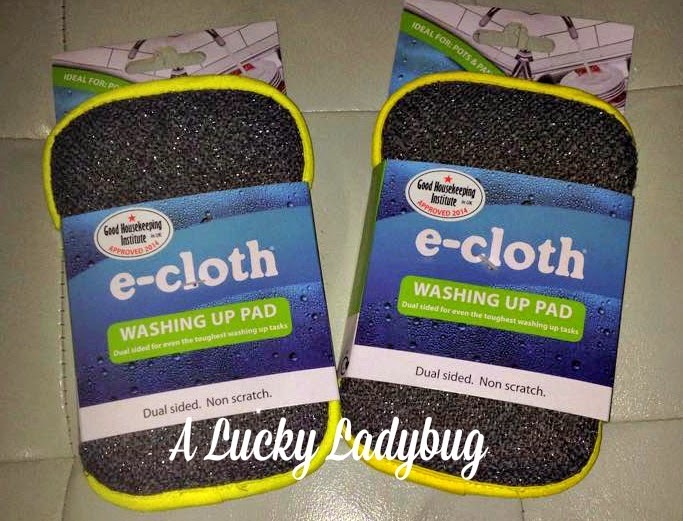 Giveaway: e-Cloth USA is going to give one of A Lucky Ladybug's lucky readers a 9 pc. Home Cleaning Pack to have of their own. We recycle, conserve water and energy and try to keep our waste to a minimum. We always recycle kitchen scraps for my garden. We can stop using paper towels and instead use cloths for our cleaning. I love it when you do reviews. You're reviews are very informative. We recycle paper -- we have a secured shred bin that we put all of your paper into and they pick it up once a month for recycling. We recycle our plastic, glass, metal, cardboard, and newspapers. We also compost everything we can. I recycle everything possible and compost kitchen waste. We recycle everything we can. 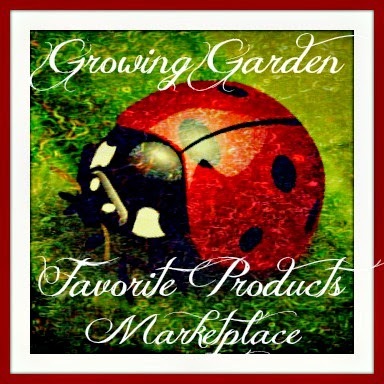 We repurpose lots of stuff, and we don't buy as much! We recycle everything we can and reuse what we can't. We also use cloth diapers, cloth unpaper towels and I upcycle clothing by sewing used clothing into cooler new outfits! What my family does to help the environment is that we always recycle. I'm setting up a vermicomposting system so I don't have to throw my fruit and veggie scraps in the trash while yard waste collection stops over winter. We recycle aluminum & refurbish & reuse whenever we can. My family composts, farms our own food, recycles, does not drive to and from work, conserves water by having short showers and hangs our laundry on the line. We recycle just about everything and what I cant recycle I try to find a use in my crafting I hate to throw anything out if I can help it. We recycle everything we can, and we reuse containers and bags as much as we can. But one thing I'm teaching my family is that it's the little things that count. We collect rain water for watering all of our plants and gardens! Our family recycles and that involves garbage, but also the things that we are not using any more. We usually give things away to people we know and then to charities, such as the Rescue Mission or Goodwill. We recycle, my boyz are boy scouts so they practice the leave no trace when they are camping or anywhere public. Turn off the water when brushing our teeth, try not to take long showers. We try to recycle and reuse everything we buy. 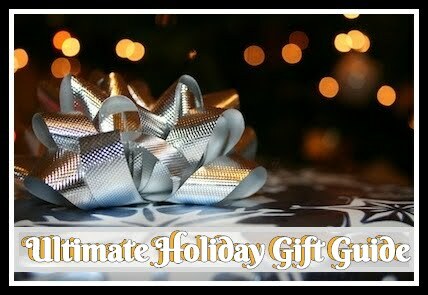 I really like seeing what you have coming up for the Holidays..my giveaways come so fast, I would be posting pics, but my darn phone is ooc trying to get fixed, but I appr everything so much!! We recycle everything that we possibly can. We also try to buy from environmentally responsible companies. We pick up trash in our area. We help the environment by collecting rain water for our house plants, recycling and reusing re-purposing products, and doing our part to pick up after ourselves. As a backpacker, I firmly believe in no trace. I also try to leave areas better than when I got there. My family recycles plastics and aluminum. We recycle everything we can, and we reuse containers and bags as much as we can too. We recycle, but I think the best thing we do is not buy disposable cups and water bottles. My family recycles and also is a part of a neighborhood group who picks up trash once a week! Well, we recycle everything we can, and I feed anybody or anything that is hungry. I am also making an effort to flush less. I don't like it, but I do it. We recycle and we also clean up. I buy or make natural cleaning products. We drive as little as possible and do our very best to combine errands when we do. We reduce our trash output, we recycle, we re-use and repurpose items. We donate or share gently used items and buy books at a used book bookstore. We use (and reuse) hand-me-downs. My older son passes his clothes that he's outgrown to my niece. When she's outgrown them, anything that can still be worn, is passed back to m younger son. We recycle and we walk wherever we can instead of taking a car just to go a mile down the road. I have a mop that I wash the pad to clean the floors. We recycle everything we can too. I try to give things away versus throwing them out. 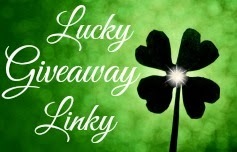 Thanks for the giveaway…when we hand wash our pots / pans, cutlery, or any dishes, we save the "grey water" & rinse water and use it to water our vegetable / flower garden in spring / summer, and any of our landscape trees / shrubs the rest of the year.